Clickbait headline: why is this book so inspiring? Lessons of Hope is a gossipy semi-memoir of the NYC’s education chancellor in the 2000s. 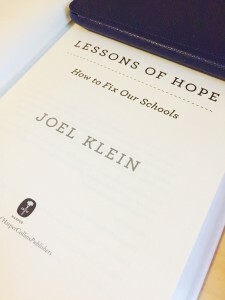 Joel Klein details his struggles with the powerful NYC teachers union, the reforms they undertook and why, and a bit about what it was like working for Michael Bloomberg. They nudged towards teacher accountability and constantly created smaller schools, sometimes even housing multiple schools in the same building. The other main initiative was creating strong principals who were allowed to be fully in charge of their schools. It was a very interesting read. NYC is a special case. It’s bigger than other districts and has more needs to fill. Not all of the remedies will work for all school districts. But Klein’s passion and energy for better schools serving the children comes through loud and clear and is infectious. He emphasizes the need to prioritize the less well-off students. Children of upper-middle and upper class parents will be fine; poorer students don’t have that luxury. At one point he says, “You have to measure what the school brings to the children, not what the children bring to the school.” It’s easy to do well by bright, well-off children. It’s harder to do well by poorer children; that’s where schools can really make a difference. So: I like Lessons of Hope because of his passion and focus.